It gives me an immense pleasure to inform you that submit high-quality written works presenting original research with profound ideas and insightful thoughts. Research Scholars / Faculty Members/ Creative Writers/ Professors can send their authentic scholarly and unpublished research articles, short story, poems, book review and interviews of English Language and Literature from all over the globe. Authors should read the Guidelines for AuthorsÂ on the journal's page before making a submission. Manuscript should be prepared according to the style and specifications of the journal's policy. Data fabrication means the researcher did not actually do the study, but made up data. Data falsification means the researcher did the experiment, but then changed some of the data. Both of these practices make people distrust scientists. If the public is mistrustful of science then it will be less willing to provide funding support. Taking the ideas and work of others without giving them credit is unfair and dishonest. Copying even one sentence from someone elses manuscript, or even one of your own that has previously been published, without proper citation is considered plagiarism use your own words instead. All listed authors must have made a significant scientific contribution to the research in the manuscript and approved all its claims. Don't forget to list everyone who made a significant scientific contribution, including students and laboratory technicians. 1) Papers should be submitted as MS Word 2003-2007 attachments only. 2) The text of a submission should only be in ËœTimes New Roman font, of 12 point font size and single line spaced paragraphs. Margin of 1 inch on all four sides. 3) Title of the paper: bold, title case (Capitalize each word), centred. Text of the paper: justified. A concise and informative title. The name(s) of the author(s). Name of affiliation(s) and address (es) of the author(s). The e-mail address, telephone numbers of the author(s). 4) Please provide an abstract of 150 to 200 words. The abstract should not contain any undefined abbreviations or unspecified references. 5) Please provide 3 to 4 keywords which can be used for indexing purposes. 6) The research paper should preferably range between 3000 to 4000 words. But in some cases, we accept the papers with more than 5000 words also. 7) All figures and tables of the manuscript should be embedded into the original text. Separate files will not be accepted. 8) Author(s) should follow the latest edition of MLA 7th Edition or APA. Don't use Foot Notes. 9) Every paper must be plagiarism free and original. It should include the name, qualification and affiliation of the author(s), after the title. 10) Writer should have minimum qualification of Post graduation degree. 11) The research paper sent for publication should be un-published or be under review for any other journal. 12) For web references, as a minimum, the full URL should be given along with the date. 13) All the articles are sent to referees. The identities of authors and reviewers are not revealed to each other. The authors should ask to revise their manuscript in the light of their comments. 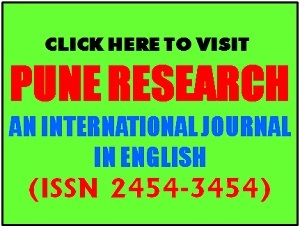 There is blind evaluation by at least two reviewers from the journal's editorial board as well as the academic experts. 14) Kindly, Fill Copyright agreement form sends to us. 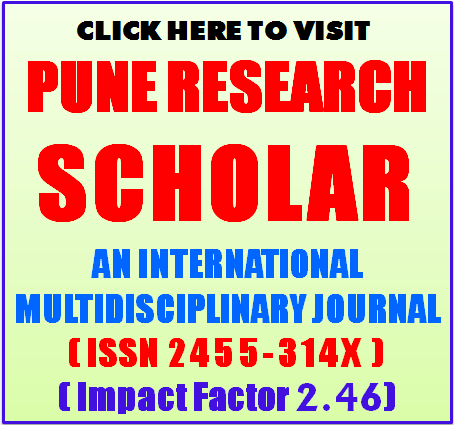 Opinions, ideas and views expressed in articles and creative pieces published in this Journal are those of the authors and do not necessarily reflect the views of the editors, the editorial board or the publisher. 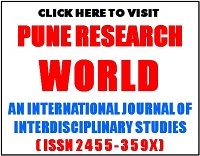 Copyrights of all materials published in PUNE RESEARCH An International Journal in English are held completely by the Journal and the respective author/s. Any reproduction of material from the journal without prior permission will result in the violation of intellectual property laws.